Building a fire in wet weather presents special problems. Dry tinder and kindling are difficult to find, and even the driest materials that you find will be somewhat damp due to humidity. Igniting these materials requires more heat and longer burning time from your tinder. It also helps if you can locate highly flammable materials that will ignite in spite of high humidity. In nice, dry conditions you can be a little lax in your fire building technique and still get a good fire going with little trouble. In wet weather everything must be perfect. You must choose your fire building location carefully, you must locate the best and driest materials for your fire, and you must have a near perfect fire lay. Finally you must be ready to protect and nurture the first flames of your fire until they have developed enough to become self-sustaining. Failure in any one of these areas means that you will have no fire. Wet weather fires need to be on high ground to avoid flooding. Also, don’t dig a fire pit for your fire. Normally safety considerations would preclude building a fire under overhanging limbs, but sometimes the finer points of safety must yield to survival. I have found juniper trees to shed water better than any tree in my area, so when building a fire in the rain I look for a big juniper tree with the lowest limb eight to ten feet off the ground. Use common sense in a situation like this. Keep your fire small, and avoid using fuel that produces a lot of sparks. Of course, the fact that it is already raining will make the danger of a spreading fire very low. A big advantage of building your fire near a juniper tree is that you will have a ready supply of tinder in the form of juniper bark. The best way to make sure that you have dry tinder is to carry it with you. 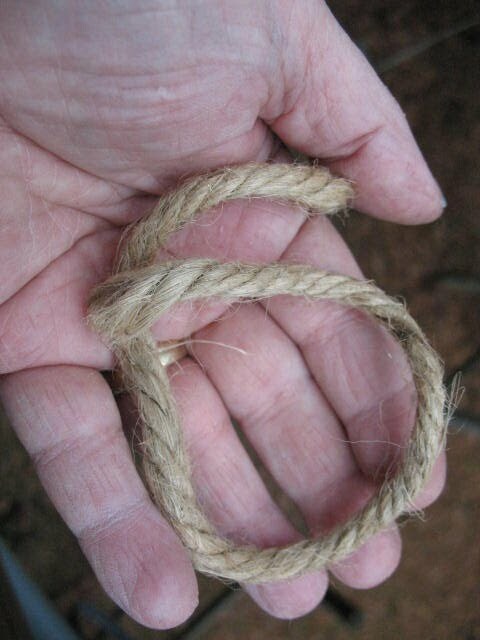 One of the best and most compact sources of tinder is jute rope. Jute rope is medium brown in color and separates easily into very fine fibers. Jute rope was widely used at one time for making macramé plant hangers, and it is still available in hardware and hobby stores. A piece of one-quarter inch jute rope that is two feet long takes up hardly any room in a pack or jacket pocket. 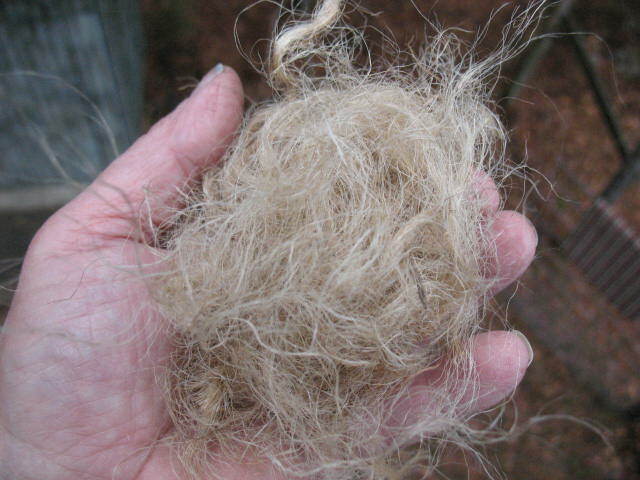 That same two feet of jute, when separated into fibers, will make a bundle of tinder the size of a soccer ball. Jute is highly flammable, in fact it burns a little too fast. 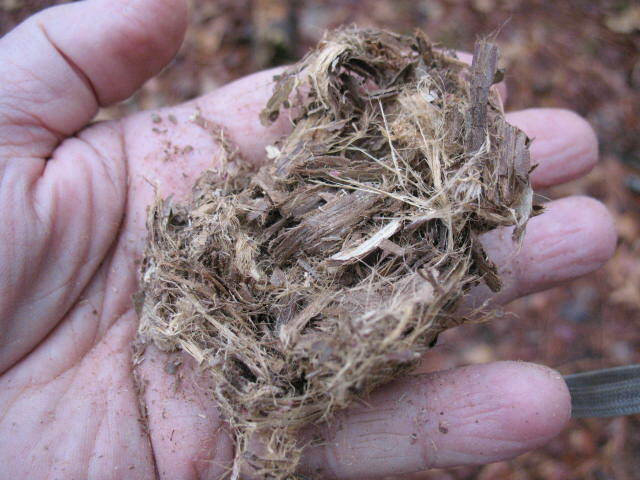 Your tinder will burn a little longer if you mix the jute fibers about fifty-fifty with dried grass, shredded cedar bark, dry pine needles or some other form of natural tinder. If you can’t find any dry natural tinder, stick with straight Jute. If you mix the jute fibers with damp tinder, the jute will absorb moisture and become difficult to light. You will be better off using straight jute and making sure that your small kindling is the kind that will ignite rapidly from burning tinder. Pictured below: Jute rope and shredded jute. 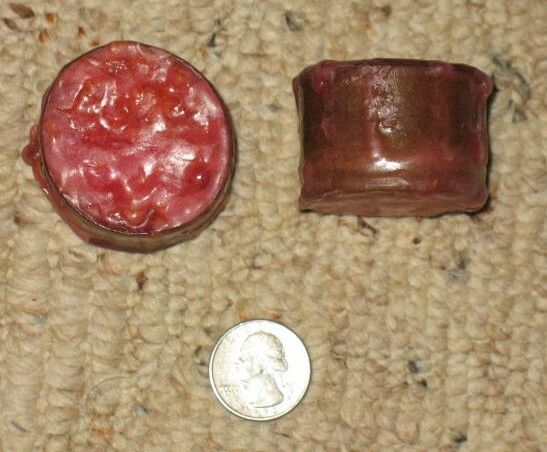 Another very helpful item to carry in your pack or pocket is a beeswax candle stub. I stress beeswax because beeswax candles burn so much longer than paraffin candles. A one inch stub of beeswax candle will burn for up to forty-five minutes; long enough to dry out and ignite damp kindling. Very effective fire starters can be made by filling an old toilet paper tube with a mixture of sawdust and melted paraffin See my post of December 2008 for exact instructions on how to make these fire starters. 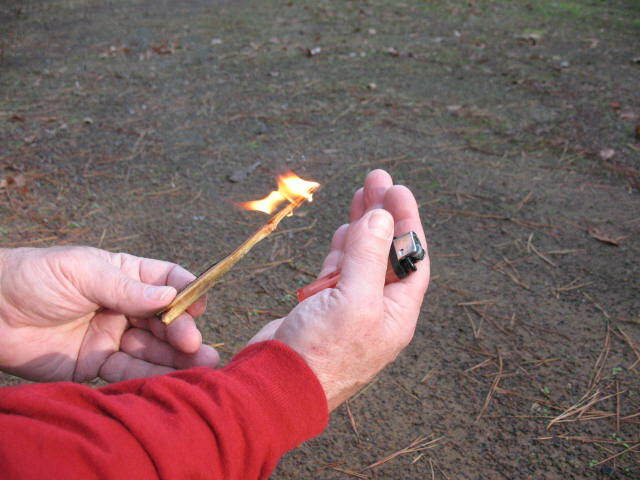 Throw a couple of these fire starters into your pack, or the pocket of your jacket before you go into the woods. When you get ready to use these fire starters, all you have to do is peal back a little bit of the cardboard along the spiral seam around the tube. Light this protruding bit of cardboard just like it is a wick. In a matter of moments the entire fire starter will be burning, and it will continue to burn for quite some time. You should have no trouble igniting damp kindling with one of these handy little devices. Pictured below: Paraffin fire starter. Gathering natural tinder in the wilds is a fairly simple matter in dry weather. It becomes more difficult when the weather is damp and rainy. Rain is usually accompanied by wind, and if the wind is blowing from only one direction, most tree trunks should be fairly dry on one side. This is the side of the tree that you want to go to when you are looking for tinder and kindling. 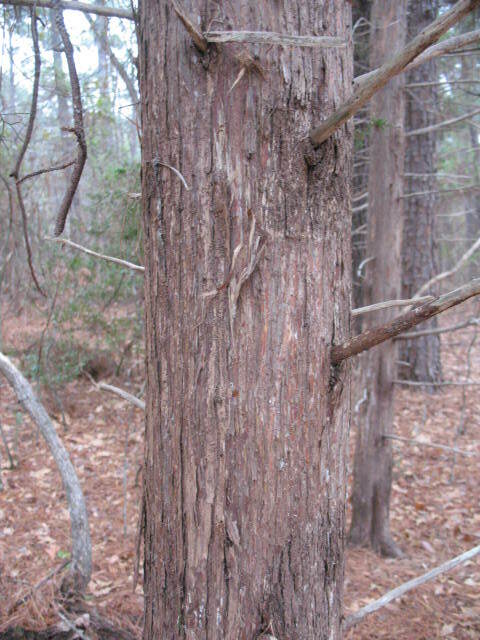 One excellent source of dry tinder is the inner bark of the cedar or juniper tree. 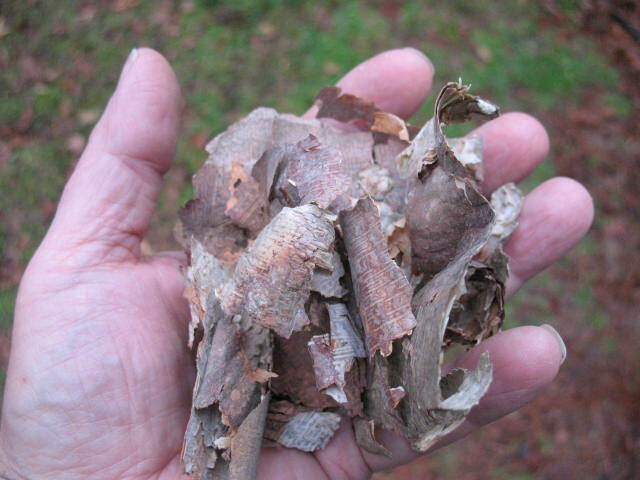 Look to the dryer side of the tree and start peeling off strips of the long brown fibrous bark. 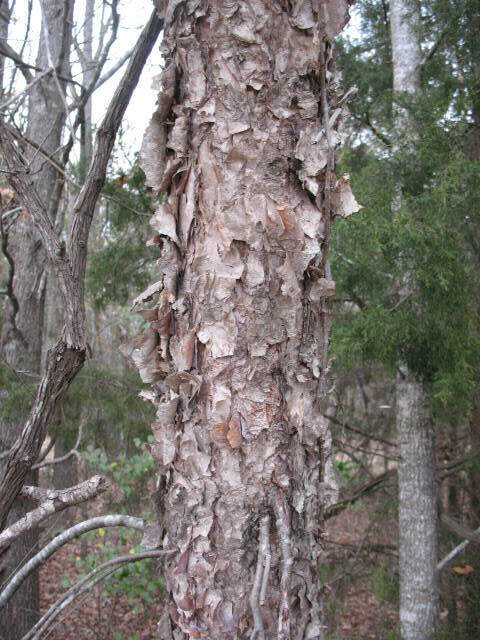 Just beneath the course outer bark, is a layer of softer inner bark. Because it is protected by the outer bark, and because you are removing it from the dry side of the tree; inner bark is usually dry and ready for fire starting. pictured below: Cedar bark on tree and shredded in hand. The bark of the River Birch tree is excellent for wet weather fire starting. It is not fine enough to be ignited with flint and steel or a fire-bow-drill; but if you can apply a flame to it, this bark will burn like it has been soaked in kerosene. It is, in fact, very rich in oil as you will be able to tell by the black smoke that it puts off when burning. One tip about River Birch bark; don’t pack it tightly into a fire set-up. It will not burn well unless you leave it fairly loose where the oxygen can get to it. Pictured below: River birch bark on tree and in hand. Many kinds of grasses have highly combustible seed heads on them in the fall and winter. Look for soft, downy seed heads on tall grasses. Some of these are so combustible that they will light even in a pouring rain. Dry cattail down does not make good tinder by itself, but it can be mixed in with other tinder to help catch the initial spark and spread it. The hardest part of building a fire in wet weather often comes after the initial flame has been ignited. All too often, a person will take great pains to locate good tinder and get it burning, only to have their fire fail because the flame does not spread to the selected kindling. This can be extremely disheartening, especially if the tinder was hard to locate and ignite. Once you get that first flame, it is important both physically and psychologically to have it become a self-sustaining fire. To turn your flame into fire, you must use the right kindling. It must be dry, combustible, and small enough to ignite from the tinder. The term kindling does not mean a specific size of wood. It merely refers to the wood that is ignited by burning tinder and then, in turn, ignites the larger fuel logs of a fire. In size, kindling may range from matchstick size to sticks that are two inches in diameter. 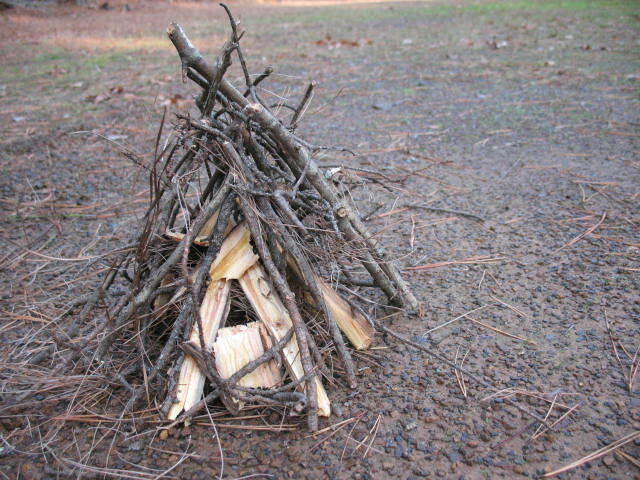 The most common mistake in fire building is trying to start off with kindling that is too large. The initial layer of kindling that is placed over your tinder should be very small, no larger in diameter than a matchstick, and there should be a lot of it. This is important in any weather, but it is doubly important in wet weather. The next layer of kindling should be only slightly larger, and the layer after that only slightly larger again. I cannot stress strongly enough that each layer of material in your fire set-up must increase in diameter very gradually over the layer below it. This is the only way that you can be sure of your initial flame growing into a fire. One of the best-known sources of dry kindling is squaw wood. Squaw wood refers to the very small, dead limbs that stick out from the lower trunks of trees. Trees that grow in thickets tend to overshadow their lower limbs. These limbs die but remain attached to the trunk. They are off of the ground, so they don’t absorb ground moisture. The foliage above them protects them, to some extent, from falling rain. To find good squaw wood just look to the dry side of the tree and start snapping off the brittle twigs that you find there. If they don’t snap, you don’t want them. 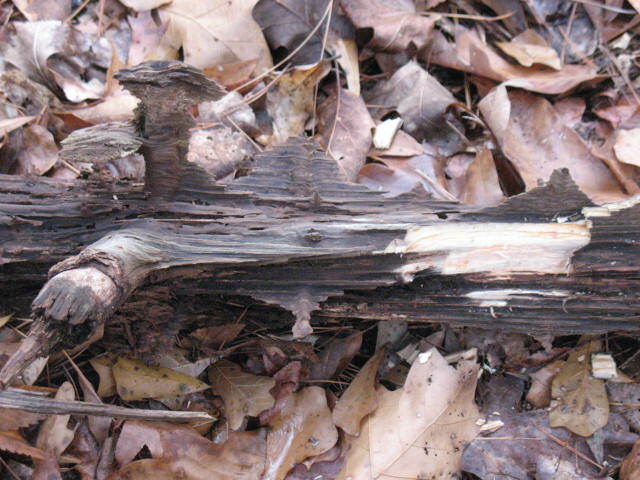 Pine thickets are a great says be at the center where the pinesap has collected and concentrated itself in the wood. Rich pine will remain after the entire rest of the stump has turned to dust. The presence of rich pine can be confirmed by its smell. It has a strong turpentine aroma. Rich pine is extremely flammable. It will even burn after it has been submerged in water. Split a piece of rich pine up into varying sizes of kindling and lay it over your tinder. It will catch easily and burn for a good while, enabling you to ignite other kindling that may be a bit damp. Rich pine gives off a black, resinous smoke as it burns. Do not breath this smoke as the resins may damage your lungs. Do not cook over rich pine. The resinous smoke will impart a bad flavor to your food and may upset your stomach. Pictured below: Rich pine log and piece of rich pine burning. If you have an axe you can always find dry wood by splitting open logs and removing the dry wood from inside of them. This method is hard work, but it is sure fire. You can split the dry inner wood up into varying sizes of kindling and even small fuel logs. Once you have these pieces of dry inner wood burning well, they will produce enough heat to dry out and ignite the damper portions of the log that you have split. If the weather is wet it is very helpful to split fuel logs. This exposes the dry inner wood, which can be placed in contact with flames first. As the dry wood catches and burns it will help to dry out the remainder of the fuel logs. Fuel logs should be added as soon as possible so that all available heat can be used to dry them. Additional fuel logs should be lain as near as possible to the fire so that the heat will start to dry them even before they are added to the fire. Try not to lay the “fuel logs in waiting” directly on the ground where they will soak up water as fast as you can dry them out. Lay a couple of small logs down as a support and set a fuel log on top of and across them. Lay your fuel logs so that the sides are exposed to the fire, and rotate them regularly so that they dry on all sides. Once a fire is burning well, you can put some pretty damp logs on for fuel, and they will still ignite; but be careful not to put too many on at one time, or you may kill your fire. Use only very dead wood for fuel. Soft woods like pine and willow will ignite at lower temperatures than hardwoods like oak and hickory, but hardwoods will release more heat, burn for a longer time, and produce better coals. If you have access to both kinds of fuel, place some softwood on the fire first and then, after it catches well, add your hardwood. The teepee fire lay is excellent for wet weather. Each succeeding layer of material in the fire lay protects the layers below it from moisture, and the conical structure of the teepee fire lay helps shed water as the fire ignites. Pictured below: Teepee fire lay. 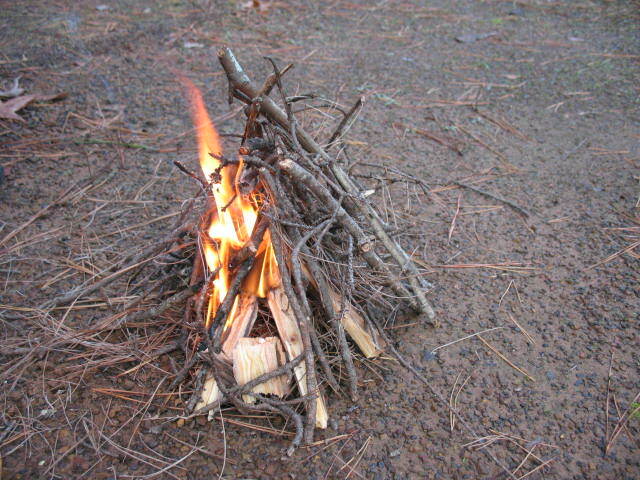 To start a teepee fire lay you will need three sticks to serve as the base of the teepee. These sticks should be about a quarter of an inch in diameter and about a foot long. Shove the bases of these sticks into the ground with an equal distance between them to form a tri-pod. The sticks should slope in at a forty-five degree angle and should cross about two inches from the top. This will leave you with eight inches of space inside the tripod for tinder. Fill the interior of the tri-pod with the driest and finest tinder that you can find. Rather than placing the tinder flat on the ground, try and push it up into the top of the tri-pod leaving a hollow, or small cave, at the bottom of the tinder. This is where you will ignite the fire, so it should face into the wind. Now begin leaning small sticks of kindling vertically around the tri-pod. Use very small, very dry twigs for this. Cover the outside of the teepee completely will twigs except for a small opening on the upwind side that will give you access to tinder. Add additional layers of kindling, gradually increasing the size of the kindling with each layer. The final layer of kindling may be as large as three-quarters of an inch in diameter. When you have gathered all of the necessary materials and prepared your fire lay, it is time to ignite the fire. If you have a candle stub or a fire starter with you, you can place it into the small tinder cave inside of the teepee and ignite the fire starter. 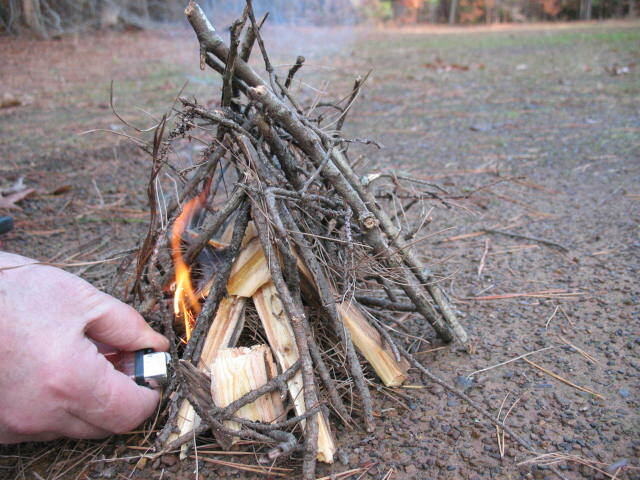 If you do not have a fire starter, you will need to take a small handful of dry tinder and light it outside of the teepee. When this bundle of tinder is burning well, shove it into the tinder cave inside of the teepee. If your materials are dry, and your fire lay is correct, the flames from you tinder should spread rapidly through the kindling; and you should have the beginnings of a good fire. When it is apparent that your fire is going to catch, you should begin adding larger pieces of kindling and then fuel logs on the fire. Try to add the driest wood that you have first so that the heat from this material can dry and ignite some of the damper wood that you will be forced to use. Pictured below: Lighting teepee fire and teepee fire burning. Hi, In any weather conditions (also in the long rain period or in winter) there is always on fir the small dry branches – easy to fire on. one more material is resin from pine or fir – also flamable and it doesn’t get wet. 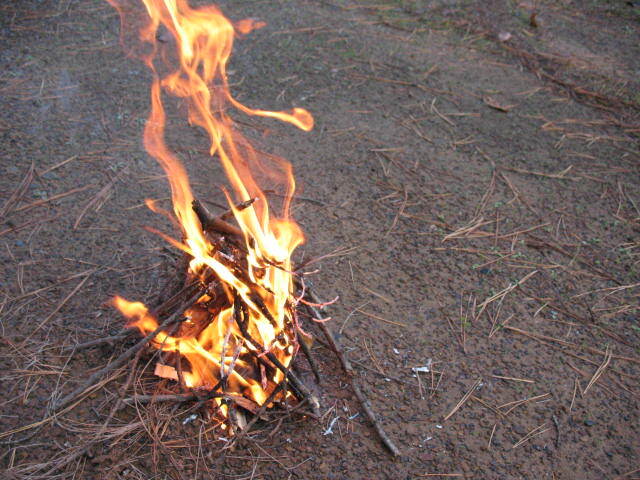 So even green branches from fir or pine is better to use in fire than other wet wood. using steel or iron wire like a handsaw on fir or pine, makes wire very hot in very short period – much easier and faster than using drill to get fire.